Was This Just a Lucky Swing Trade? If you dump a stock right before it tanks, did you get lucky? Sometimes intuition is just a better gauge of what to do and what not to do. After you have been trading for a while, you just tend to get a feel for things that can't really be teached. This is where "luck" comes in. Here is an example of a trade I made that illustrates this point. 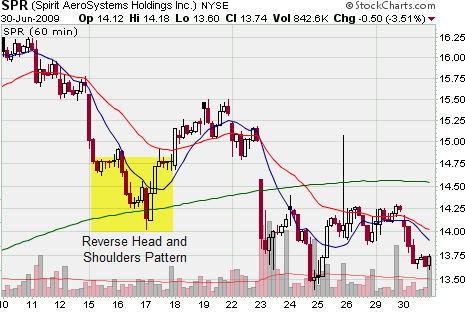 This stock was in the process of forming a reverse head and shoulders pattern. And if you look at the "head" part of the pattern, you can see that it tried to break down but quickly reversed (no follow through), which is bullish. I expected a move higher, so I bought the stock. But there was something on the daily chart that I really didn't like. Look back up at the first chart. Can you see it? 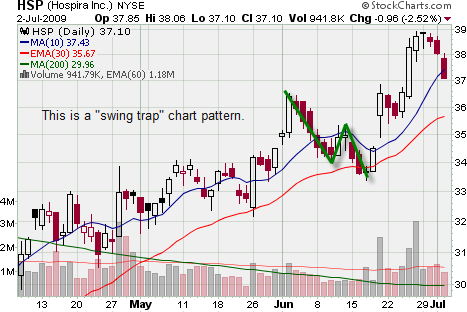 This stock gapped up, after an already extended move to the upside. This is a gap caused by amateur traders - not professionals. And it a very good sign that the trend is coming to an end. 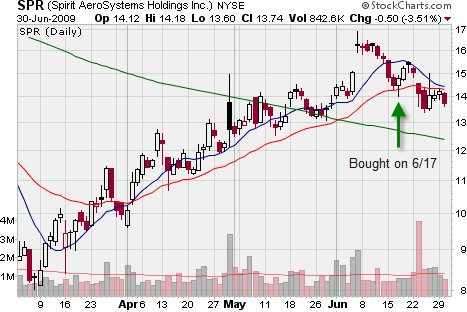 Also, the stock didn't move very much on the gap, and it was a high volume day (churning). Not a very good sign for the continuation of the trend! 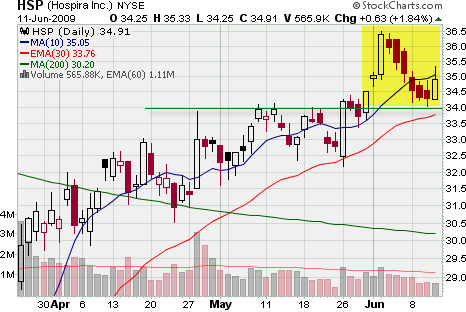 This stock moved up a few days and I dumped it on 6/19 at $15.29 - right before the gap down. There was no reason to mess around with trailing stops since I didn't think the trade was going to last very long anyway. Some would say that this was just a lucky trade. Luck is the direct result of hard work. Sometimes a failed pattern can turn out to be a profitable trade. 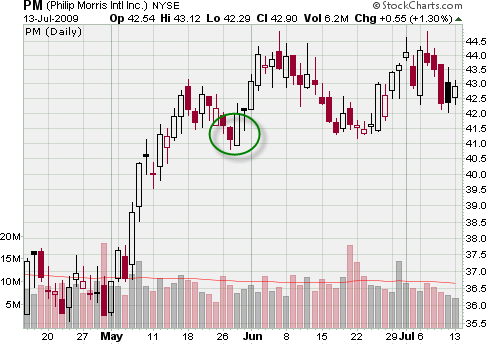 This stock pulled back to support after multiple down days and then formed one of my favorite candlestick patterns - a bullish engulfing candlestick pattern. This would have been a very good entry setup for me. And I probably would have traded this stock. But, I would have gotten stopped out. This stock had one more up day and then it tanked. If you have been swing trading for any length of time, then no doubt this has happened to you. The pattern fails only to skyrocket over the next few days. This stock moved below the prior swing point low taking out all the stops and then formed a doji on increased volume. Then it was off to the races. Most traders would just move on to another stock after getting stopped out (which is what I used to do!). But, if you keep an eye on the stock, you may discover that the failed pattern and the second entry is better than the first. Do you trail your stops? I recently got the new book by Larry Connors called High Probability ETF Trading. With that book came a free report called 3 Great Exit Strategies For Traders. At the very beginning of the report he makes a good case for not using trailing stop loss orders. The problem with trailing stops is that as a buyer, you are always exiting on a low. By definition you are always exiting on weakness." The short seller has the opposite problem. The short seller is always covering his or her position just as it is showing strength by exiting at the high. Let's say you bought this stock on the engulfing candle (circled) and then trailed your stops under the lows. Well, his point is that you will get stopped out only when the stock falls and takes out your stop. You would be exiting on weakness. And this goes against the whole philosophy of swing trading which is, "Buy weakness and sell strength". In this example, you bought weakness (the pullback), but you sold on weakness also (got stopped out). There is nothing wrong with trailing stops as an exit strategy. Plenty of traders use them and are successful with them. So, he is not totally against trailing stops but he definitely doesn't use them.